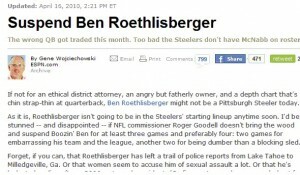 Lest anyone be mistaken by the headline, this article offers no defense of Ben Roethlisberger. Nor is this thread intended to decry the “one-sided” treatment that Ben has gotten in the press. I am not terribly sympathetic to that argument, but I concede that the article referenced makes some valid points. In the same vein, others have already pondered the significance of Roger Goodell’s suspension of someone who neither failed a drug test, nor was arrested nor charged with a crime. Roethlisberger richly deserves the criticism the media vultures are heaping on him. Roethlisberger has granted the press every right to question is locker room presence and leadership skills and rip into to his reputation. But open season on Roethlisberger does come with one caveat. All criticism of Roethlisberger must be constrained by the facts. Unfortunately for some, that seems to be a problem. ESPN.com’s Gene Wojciechowski is an excellent writer and his analysis of the NFC Central is always worth the read. He recently lit into Roethlisberger, going as far as to suggest that Dan Rooney, if forced to confess, would admit to regretting not trading for Donovan McNabb. A stretch? Perhaps. Plausible? Certainly. But in building up his argument, Wojciechowski takes a little license with the facts. Ah, the power of two words. 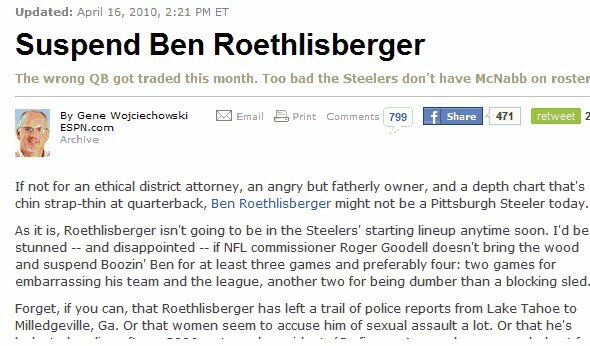 If Wojciechowski had only written “…Roethlisberger has left a trail of sexual assault allegations from Lake Tahoe to Milledgeville” his prose would have been just as lyrically compelling, just as damming. He only would have had to add an extra word. And he would have had the virtue of being factually correct. Alas, Wojciechowski’s word choice of “police reports” takes him outside the facts. One undisputable fact behind the Lake Tahoe allegation is that the woman in question never, ever went to the police. While the Georgia incident rightly casts the Lake Tahoe allegation in a new light, it changes none of the objective facts on the ground in Nevada. Legally there is a world of difference between an accusation in a civil suit and a criminal complaint. Wojciechowski undoubtedly knows this, but his article brazenly ignores this. We can only speculate because Steel Curtain Rising has contacted Wojciechowski via email inviting him to comment, and a week later has received no response. A day or so after Fred Bright announced his decision not to prosecute Ben Roethlisberger, ESPN’s Adam Schefter issued a scathing video commentary on the Steelers quarterback. Steel Curtain Rising takes no issue with the tone or tenor of Schefter’s remarks. However, when Schefter offered that that Roethlisberger’s off the field behavior was disrupting the team, he commented that this was not the first incident, reminding everyone of his motorcycle accident and the Nevada affair. To emphasize how much of a disruption Ben had become for the team, Schefter said that Ben had caused off the field distractions “three straight off seasons,” referencing the motorcycle accident, the Lake Tahoe allegation, and the Georgia allegation. Later, before concluding his video segment, to drive his point home Schefter again made the “three straight off seasons” remark. Almost four years to be exact. Which of course means that Schefter conveniently simply forgot or ignored the fact that, at least as far as the public has knowledge, Ben’s off the field behavior did nothing to disrupt the Steelers during the 2007 and 2008 seasons. The interesting thing about this, is that the video segment is no longer available on ESPN.com. Nor can you find it on YouTube. 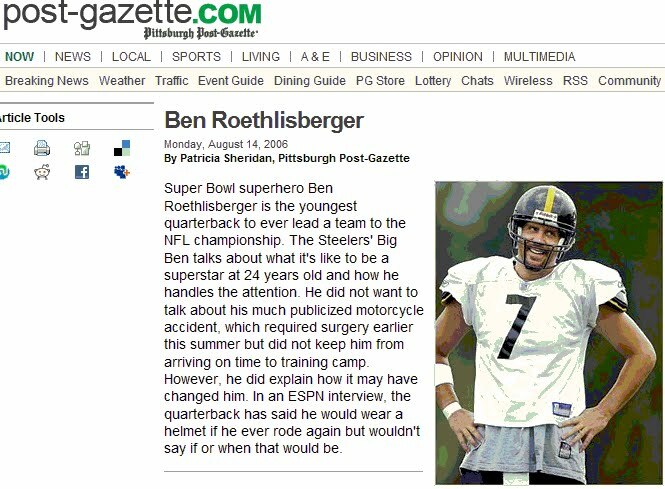 Perhaps some editor decided to take it off line realizing that, for whatever problems the Nevada and Georgia incidents are causing the Steelers, they were separated by two full years from the motorcycle accident. Even if this is the case, no mention of Schefter’s error can be found on ESPN’s corrections page nor by the site’s ombudsman. No email address for Schefter is present on the site, so he could not be reached directly. Liberality with the facts is not confined to ESPN, but also extends to the New York Times, one of the United States’ most respected publications. Arguing that the NFL has not been sufficiently harsh with Roethlisberger in the past, Times columnist William C. Rhoden chides the league for its lax response to Ben’s 2006 motorcycle accident. Some quick Google searching confirmed my memory. 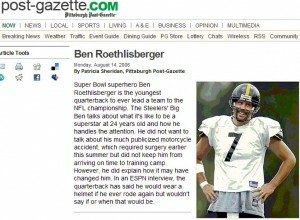 Roethlisberger told Good Morning America in the spring/summer of 2006 that he was not sure if he would ride again. Steel Curtain Rising asked Mr. Rhoden why he attributed such a statement to Ben Roethlisberger. Inviting him to share an interview where Ben contradicted himself about riding again (with or without helmets) or some other sourced report that confirmed the statement he attributed to Roethlisberger. Unfortunately, Mr. Rhoden did not respond to an email message. …Ah But What about the SI Article? As everyone in Steelers Nation knows, Sports Illustrated just published a cover story on Ben Roethlisberger, and the portrait they painted was not pretty. But about the only new information they unearthed was to report that Ben has been riding his motorbike without a helmet since the accident. One report is from an a neighbor who refuses to give his name, and another from an unnamed source at KDKA who says that they filmed Ben riding without a helmet but declined to run the footage, a claim KDKA has denied. This is an explosive charge which will and should blacken Ben’s image even more if true. And if he had sources, he owed it to his readers to share that with them. Ben Roethlisberger only has himself has to blame for the trashing of his image is taking. Even if the young woman voluntarily entered the bathroom and even if what happened inside was consensual, Ben bought the battering he now suffers lock-stock-and-barrel the moment he shut that door. It is hard to know what led these established journalists to produce material that contained statements which were factually incorrect. Absent their response, at best one can only presume that it was a lack of inclination to verify key facts, at worst it was a conscious corner cutting with an eye toward spicing up the story. Either way this is a cause for shame. It is ironic too. Ben’s critics claim that the public is entitled to know the facts. Thanks for visiting. Click here for more of the Watch Tower’s analysis of the Steelers press coverage. This entry was posted in Steelers 2010 off season, Steelers Judiciary, Watch Tower and tagged Ben Roethlisberger, Pittsburgh Steelers. Bookmark the permalink. As always, absolutely great job on disecting trougth the written articles that are put out there and question the author’s unsubstantiated facts. If only they had the decency to answer you. BTW, you can tweet Adam Schefter if you want to find him. Sorry, but as far as I know, you don’t even know WHO shut the bathroom door. It could have been her. I don’t think that Ben deserves ALL that the media has heaped on him. Hell, who knows how many of the stories are true about him at all. You just pointed out that many of the articles are inaccurate and so will be many of the stories that are word of mouth. Why can’t anyone give their names?? SI was irresponsible in reporting the article and most of it was very redundant. Gracias! Si soy el Hombre de Acero, simpre quiero hacer holmenaje al parte de Steelers Nation que quedo aca en America Latina! For those who don’t speak Spanish, I just thanked Daniel and told him I always like to pay homage to Steelers fans in Latin America. Thanks for your comment. You do make a lot of good points. It is, “interesting” to see so many people making so many judgements of Ben when there are so few objective facts out there. And I agree with you. People keep talking about “patterns forming.” While I think it would be wrong to dismiss that, another pattern forming is that so few people are willing to “Go on the record” — either to authorities or to reporters. I do have a bone to pick with the SI article, which I’ll do next week, time allowing. Stay tuned to the Watch Tower. interesting article. i haven’t seen those other things because i’ve been ignoring what the national & local media (outside of pittsburgh) has been saying about ben. you definitely point out how those articles are misrepresenting facts to make some of their points. a particular bone with me is espn. recently, their online writing has been wrought with poor journalism in an effort to make (not report) news or be the first to break news. remember the them reporting foote was cut before he actually was? yet that article magically seemed edit itself when it was found out they were wrong…and they never made public mention of their error. or saying whisenhunt had something to prove to the steelers because tomlin was selected over him for the HC job, when in reality whiz took the job in arizona before anything was decided in pittsburgh. a minor thing though, i really dont like that “media lynching” article because the guy does the exact same thing he blames the media for doing. he selectively picks out excerpts to make his point and ignores other things. for example, he doubts the reasoning claimed by girl for not continuing forward when in the case files (i read all the ones linked on the PPG website) it’s documented the girl began seeing a therapist immediately after the incident, and yes it is possible someone would pass at the chance for money to preserve their privacy. or the family’s distrust of the local cops which seems reasonable after the fact since a cop called her a “drunk *****” behind her back & around the the accused and took a picture with ben earlier in the night while on duty. he neglected to mention 1 of ben’s friends admitted that he noticed ben and the girl weren’t near the stool anymore but they also weren’t back in the VIP room. or the other friend admitting on a walk to the bathroom he ran into ben leaving the backarea and seconds later the girl leaving the bathroom. and he certainly didnt mention ben admitting to the cop thought the girl “was too drunk” to associate with…the same girl he probably engaged in some sort of sexual actions with the last time he saw her. No need to apologize for the long comment. And you’re alwaqs welcome to take issue with “stuff” on this site. I am glad we’re having a robust, and multinational it would seem, conversation about this. I know that John Clatyon generally writes good stuff and has beaten the PG to the punch a couple of times. I was never crazy about the “Media Lynching of Ben” article. The guy made some good points, but you have indicated he had holes in his argument as well — thanks for making that point, again, I was not aware of some of those issue you brought up. The issue of stuff getting put up, and then “corrected” with out any acknowledgement, is a huge one. And not just with ESPN. The PG did it a couple of years ago when they incorrectly reported that the Steelers had signed Anthony McFarland, and the Tribune Review reported just the opposite. The next day, they took down the link about McFarland signing, but you could still find it with their site search. Then a couple of days later, the link reappeared, but the article was modified. I do not know if they issued a statement about this in their “corrections” column. They may have. But I saw nothing in the Steelers section. If Roethlisberger was so disliked in his own locker room, I don’t think that he would have been voted team MVP last season, do you? The question of how Ben’s reputation in the locker room is an interesting one. Peter King wrote something about that, in early 2008, I think talking about how Ben was beginning to assert himself as a leader in the locker room. That caught my attention, because before that the word had been that Bettis had taken him under his wing, which I took to mean that he’d been more or less accepted by the rest of the team. It is true, he did get the team MVP award in 2009 — how could he not. But he had two great seasons in 2007 and 2008 and did not get the award. One thing is certain. For however he is regarded off of the field by his teammates, they have responded to him ON the field since day one.